All that work and all that fun I had during February has come to fruition. 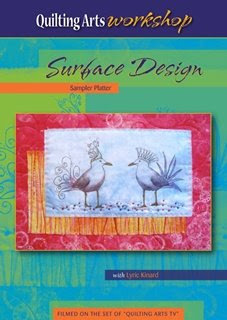 I took a peek at Quilting Arts website today and there it is – my new workshop on DVD. I haven’t seen the tape yet but it’s available for pre-order here. What’s it all about you say? Well – let me tell you. Surface Design Sampler Platter will give you a little taste of a bunch of different surface design techniques. A little stamp carving, a little stencil cutting, a little screen printing, foiling, and photocopy transfer. Sound fun? Totally! Yeah Lyric. Can hardly wait to get your book. Thanks for all your inspiration. I live for my Quilting Arts magazine and love to see your work. You can imagine my delight in finding your blog and website. Keep up the great work. That sounds like a great way for people to see various means of surface design in action, then decide what they want to pursue. Congrats! Congrats, Lyric! I ordered my copy today! Yea, Lyric! I took your first class at QU and couldn’t wait for more. Your latest filled up faster than I could register, so I’m waiting for the minute I can sign up for your next one. Thanks for the continuing creative inspiration.